Pack toilet paper and carry it with you everywhere. While western hotels, airports, and fancy restaurants might supply a roll, they are the exception, not the norm. If you'll miss it, bring it. Might as well pack some hand sanitizer and put it in a zip lock with the TP while you're at it. If you're a germaphobe, you might go so far as to throw a travel-size bottle of lysol in that bag for good measure. Bring breathable scarves/pashminas or purchase one upon landing. I got this advice from my dear friend and yoga teacher, Wendy, when I asked her what to pack and it was such a great tip! Sometimes, you don't want to breathe in or smell the air around you and wearing one helped me make little adjustments to my appearance and comfort throughout the day. Be prepared for all kinds of weather and bring practical shoes that are easy on/easy off. sneakers and/or strappy and supportive sandals that you don't mind exposing to "the elements"
It's a conservative place. Sun dresses and tank tops and shorts might draw unwanted attention. Realize that your plans and schedules are all tentative and be flexible. Don't lose your boarding pass! Pack some neutral tasting food that you can eat on the go. Granola bars, trail mix, etc. Don't drink the water. Get your drinks without ice. Be careful when it comes to fresh produce. Drink lots of chai masala. Eat all the dosas you can. I promise to post more about food once I get my pictures uploaded! Go with a strong idea of what you might want to bring home as a souvenir and seek out a reputable seller (lonely planet and trip advisor were helpful on this front). Don't let your drivers/guides (even the good ones) derail your plans by dropping you off at a "demonstration." I was taken to see special jewels, handcrafted marble tables with jeweled inlays, rugs, pashminas, spices, you name it. And I thought I was being pretty firm. Apparently not firm enough. Just say no! I had to go to the travel clinic to get a typhoid fever vaccine and malaria meds. I amped up my vitamin routine a few weeks before travel and packed one of those crazy huge pill cases full of my supplements and malaria meds so I didn't have to pack a bunch of bottles. This helped me keep with my regimen, which is a challenge at home, let alone on the road! I also doubled my probiotic dosage a few weeks prior to departure to help me ward off bugs. I didn't get the slightest touch of "delhi belly" and give partial credit to all those friendly microbes. Don't miss Delhi. I'll tell you all about it in another post, but of all the places I went and things I saw, Delhi was my favorite. I was in awe of so much of what I saw and I covered a lot of ground in a single day. That said, I felt less safe here than I did in other cities. Keep your personal belongings very close. If you can afford to, spring for a driver. He'll take you where you need to go, wait for you, and be a great resource. Just know what you want to see/do and try to discuss your optimal route if possible. It will be relatively inexpensive and you might find it a worthwhile use of your money if it means you can cover more ground, feel safe, and have peace of mind. Ignore panhandlers. THIS WILL BE HARD! They are so persistent and your heart aches for them. You will see their awful living conditions up close because they survive on the street. Mothers with babies on their hips will ask you for money to feed their children. Children will try to sell you all sorts of trinkets and the look in their eyes will break you down. But as soon as you engage with them, they won't let you go. They will walk with you to wherever you are going, even if you completely ignore them. I made the decision at the beginning of my trip to pick specific occasions/reasons to be generous/charitable and made selective donations and tipped generously. But I tagged along with a fellow American for a half a day (we met on a bike tour of Mumbai) and he didn't ignore the locals who approached him. He wasn't able to shake them once they clung on and it was so uncomfortable. Talk to people. The drivers and other people I met along my journey often asked me about my family. The first question was always if I was married and then they wanted to know all about my husband and if it was an arranged marriage or a love marriage. This served as a great reminder that Americans are not the center of the universe! India is the largest democracy in the world and so many of their customs are foreign to us so it stands to reason that your customs are just as foreign to them. OK, I think that sums up most of my tips. I'll have a posts on Kerala, Delhi, and Agra live soon! And then at least a post or two on Natural Products Expo West, where I am now! If you missed Part 1, you can catch up on the first leg of my journey here. I'll be adding pictures to all posts next week, so be sure to come back for those. The middle part of my trip was all work. I didn't do much sightseeing, but did get to spend lots of time with my colleagues in India and with students, researchers, librarians, and university administrators. It was great to get entrenched with the locals and hear about some of the cultural and academic norms from people who live here. My conversations with friends and colleagues who had been to India, my Lonely Planet, and the various podcasts and TV shows I read, listened to, and watched prior to departing for my trip prepared me well for India, but arriving here raised so many more questions. I also got some great travel tips from my colleagues who also helped address some of my natural curiosities. I had, for example, been wondering why all the business names, signs, and advertisements (billboards, etc), were in English. I knew English was spoken by many and that there were lots of local languages in India, but I guess I didn't connect the dots. Because Indians often don't understand each other's local languages, they fall back on English. This seems to be especially true for those who have attended university and/or work in tourism. Check out this language map on wikipedia to get a sense of the many languages and dialects spoken throughout India. The author workshops I delivered took me to universities in Pune, Mumbai, and Kochi (aka Cochin) and to an engineering firm in Pune. So once in India, I found myself on four more flights. I always find airports interesting, regardless of where they are and that was absolutely the case in India. They featured prayer rooms and gender-specific security lines. They had decent food and clean well-stocked bathrooms (more on this later). They did not have wifi. But perhaps the most notable observation was the security practices. I am not exaggerating when I say that they checked my boarding pass at least a half dozen times at each airport. Before you enter the airport, you have to show your photo ID and flight confirmation (the email reservation on your phone is acceptable). Then you get ticketed and have to have your boarding pass stamped at security. Then you have to show it twice at the gate (to two people back to back). Then again when you board the plane. And AGAIN when you deboard the plane! What the heck?! I guess since language is an issue, they want to make sure you're getting on the right plane? You also have to get tags for each of your carry-on bags and have those tags stamped. It's crazy! The hotels I stayed at also had pretty rigorous screening. They inspected each car on entry and made guests walk through metal detectors then get wanded by a gender-specific security officer. And bags went through an x-ray scanner, too. My colleague said that this was all to provide the appearance of security but that it wasn't really doing anything meaningful. It did make me wonder about security spending in general. I mean each hotel had several visible people to manage security. Once I was in the hotel, I received some of the best hospitality I've ever received. Actually, that hospitality started from the moment I landed at the airport since there were drivers there from the hotel to pick me up. In Delhi (next post will be devoted entirely to Delhi), I was driven home in a super fancy audi with massage features built into my seat. I could get used to this whole private driver thing if it weren't for the insane traffic. Oh that's right, the traffic. How have I not mentioned that yet? Indians must be born with superior spatial reasoning, hand eye coordination, and response times because all of the above are requisite to drive anywhere. There is an insane amount of traffic and I was shocked that I didn’t witness a single accident because cars, trucks, rickshaws, pedicabs, buses, pedestrians, bikes, motorbikes, scooter and all kinds of animals share the same congested lanes. They seem to communicate presence and passing with frequent honking, as if they're all having a conversation with each other through car horns. Some trucks even say "Horn Please" on their tailgates. Getting anywhere can be scary and I might have had an anxiety attack if I didn't just trust that my drivers were highly skilled and would get me to my destination without killing me. Somehow, I managed to convince myself of this pretty early on and I made a conscious effort to NOT look at the road in front of me any time I got in a car. It's probably worth stating at this point that I was pretty sheltered and pampered during my trip. If I had been travelling for leisure, I'm not sure I would have sprung for the 40 minute flights, the super classy hotels, or the car service everywhere. I had planned on taking trains and public transit, but my colleagues insisted that I take cars everywhere. As a result, I do feel like I didn't get to see as much of the real India as I would have liked, but it was probably for the best. I want to go back. And maybe when I return, I'll see more of the grit and I'll force myself to experience more of the crowds up real close. More on the food, Kerala, Delhi, Agra, and packing and travelling tips in the next posts in this series... I promise! And I will add pictures soon, I swear! 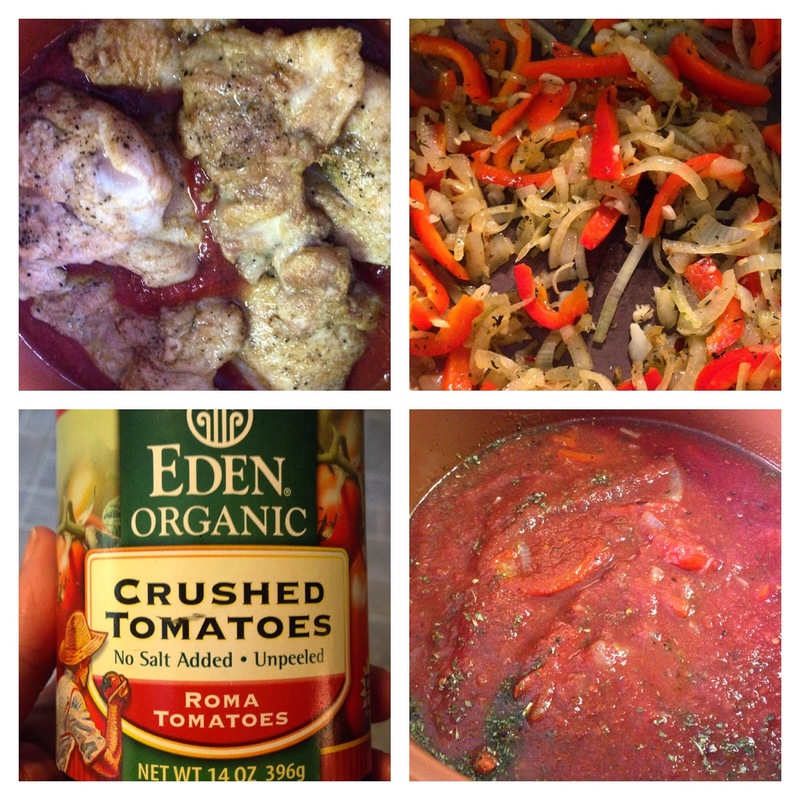 Chicken Cacciatore is a magical meal. It's hard to screw up, well-balanced, and delicious. I prepared a batch a few weeks ago and was shocked to hear that out of the 4 of us enjoying the dish, I was the only one who had ever eaten it before! I remember my mom preparing this dish when I was young and I made it for my family when my mom started a full-time 9-5 job that came with a commute (I was 12, so if I could do it then, you can do it now!). You don't need a VitaClay to cook this dish. It can simmer on the stove unattended or cook in your slowcooker all day. Like a good tomato sauce, the longer the flavors have to spend time with each other, the better. This dish is often served over pasta, but I love it over mashed potatoes and this time, I mashed some celery root with the potatoes for extra flavor and nutrition and left the cheese and milk out to keep this very filling dish from being too heavy. Nobody missed the cheese or milk and I don't think anyone would have been aware of the celery root if I hadn't told them. If you're looking for a dish that gets more veggies into your family's diet, give this one a try! 1) Bring the chicken to room temp while prepping the rest of the ingredients. 2) Coat the chicken in the flour (wheat flour is fine, too). Heat 2 tb extra virgin olive oil over medium-high heat. When hot, add the chicken and brown, cooking for about 2 minutes per side. 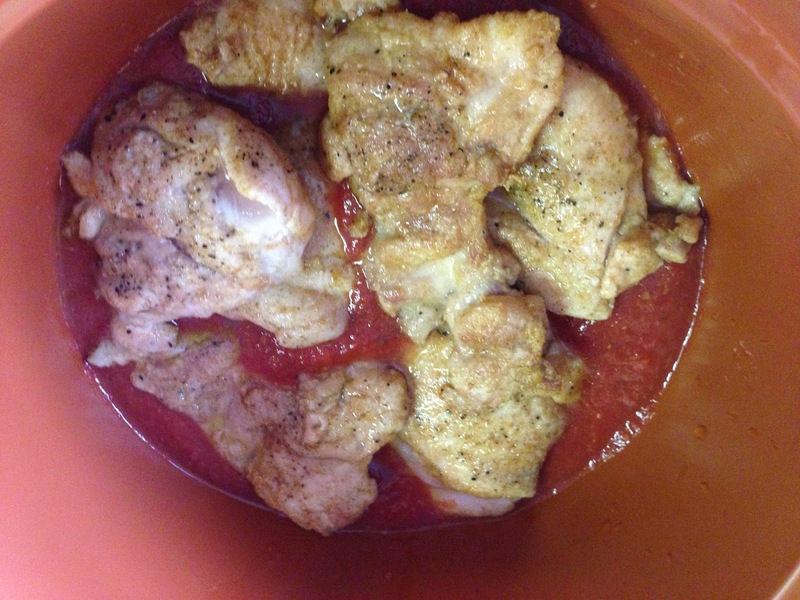 3) Remove chicken from pot and add the onion, pepper, dried herbs, and a pinch of salt and pepper to the oil. Add another tb of oil if pan is dry. 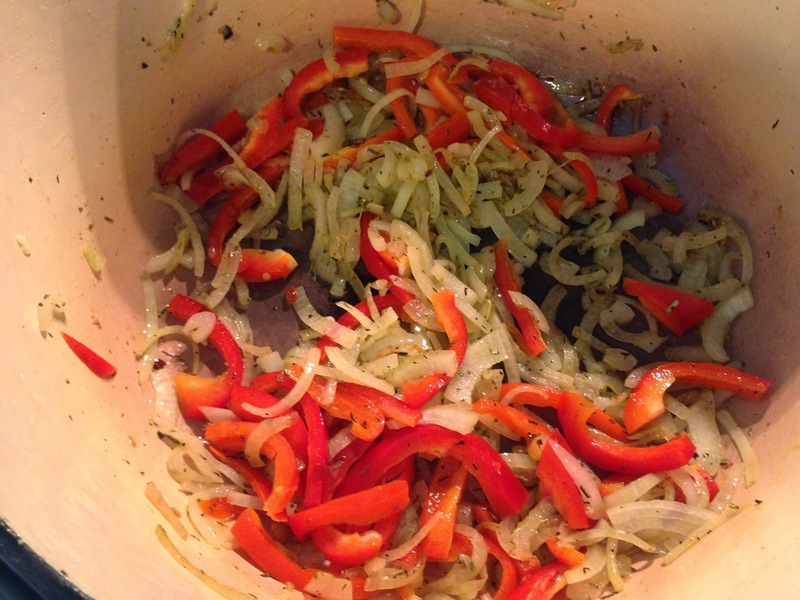 Saute until onions are translucent and peppers soften. Add the garlic and the wine soon thereafter to deglaze the pan. You don't want the garlic to brown. 4) In the slow cooker, put half the crushed tomatoes, then the chicken and everything you've sauteed, then the rest of the crushed tomatoes. Add some more salt and pepper to taste, set it, and forget it. Vitaclay: Stew for 2 hours. It'll be done in 1 and can probably go for the full 4, but 2 worked well. 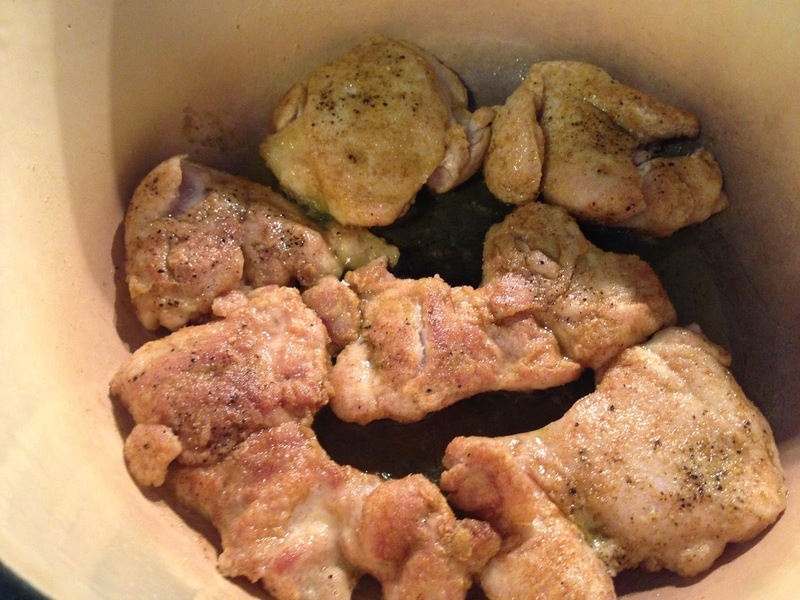 Crock-Pot/Slow-Cooker: Cook on high for 4 hours or on low for 8. Stove-Top: Simmer for 1 - 3 hours. It's ready when a chicken thigh is no longer pink in the middle but will be better when the chicken falls apart when you try to cut it with a fork. Note: If you're pressed for time, you don't need to coat the chicken in flour, brown it, or saute the veggies. You can just dump all the raw ingredients into the slow cooker and be done with it. It won't be AS flavorful, but it will still be absolutely delicious! Enjoy over pasta, mashed potatoes, quinoa, brown rice, or your grain or starch of choice.